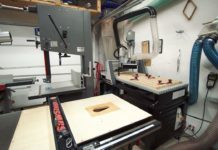 When I started woodworking I often dreamed of a solid woodworking workbench that had a few heavy duty vises installed. 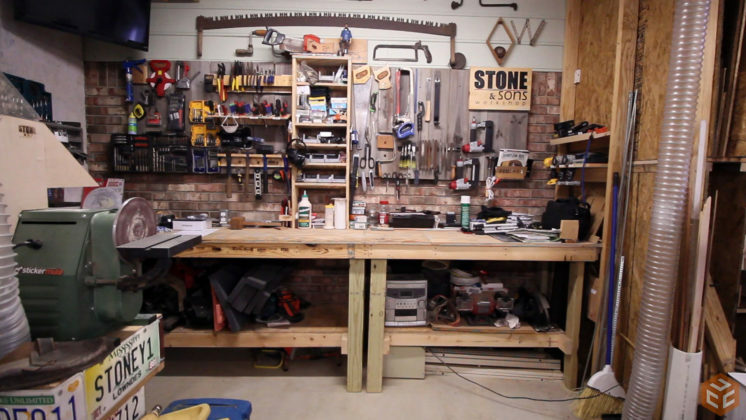 It wasn’t until about 7 years into woodworking that I made a nice woodworking workbench. 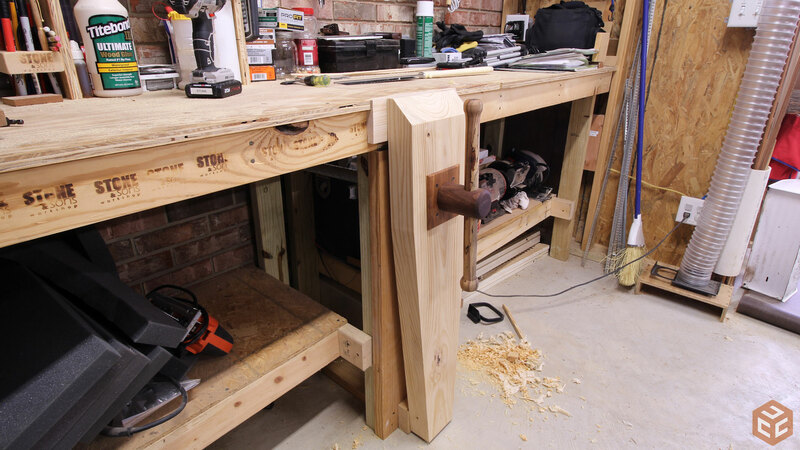 One of the main draws for that workbench project was to have a heavy duty leg vise installed. And after having it for almost a year I can’t imagine woodworking without it. There are many commercially available vise options out there but none of them are exactly inexpensive. I’ve even made a few pipe clamp twin screw style vises in the past that are really inexpensive to make but fall short on ease of use and clamping power. 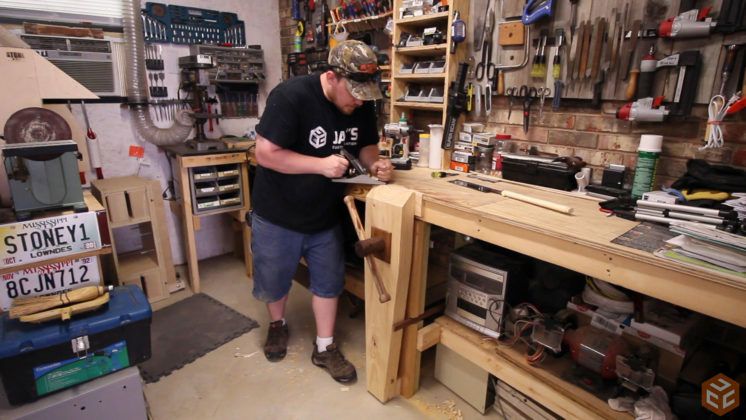 My favorite option is a leg vise. When attached to something solid it really is the best vise that I’ve come across in my opinion. That’s not to say you absolutely need a solid top, traditional style, free standing workbench for vise though. In last week’s video/article I showed the process I took in making a custom leg vise. 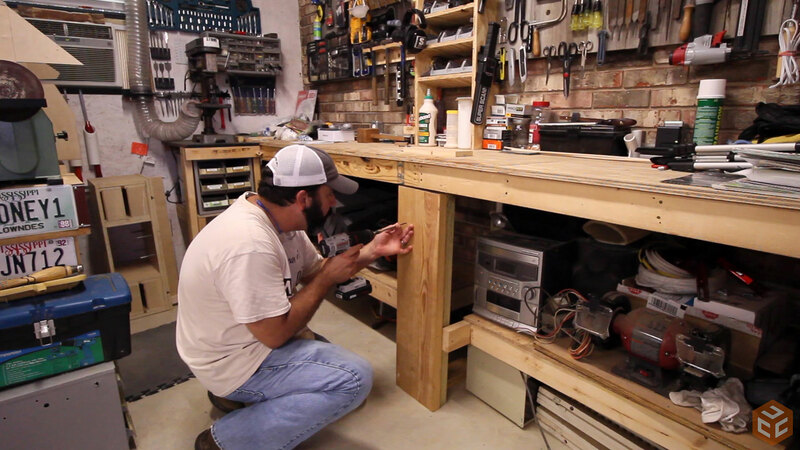 Today I’ll show you the steps myself and Shawn Stone took in installing that same leg vise in his 2×4 workbench. Here’s the vise I made followed by Shawn’s 2×4 workbench that he has secured to the wall. 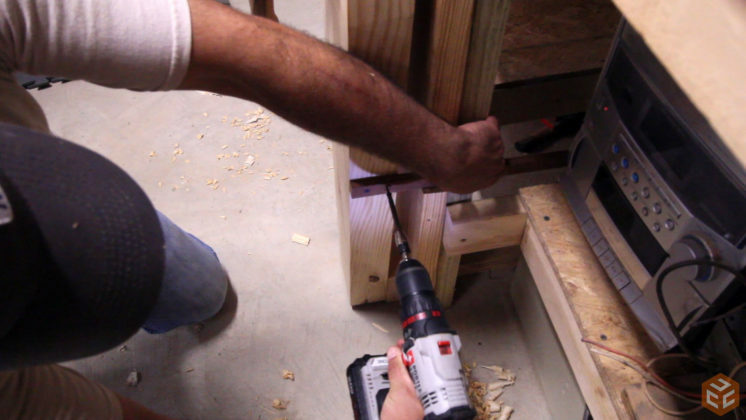 The screw that I used for the leg vise was a scaffold leveling leg. The leveling leg comes with a nut originally used to adjust the height of the scaffold. I’ll use this as the capture nut mounted inside the workbench. In order to mount it a couple holes need to be drilled first. This is a cast material so drilling the holes is super easy. 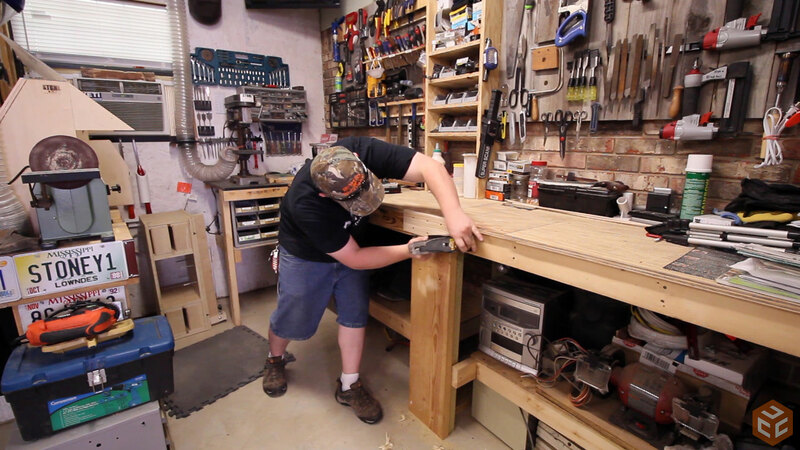 In the center of Shawn’s workbench are two independent legs. When combined they will make a good spot to mount the leg vise. In order to combine them, as well as stiffen them up a bit, Shawn secured a piece of 2x pine to the legs with a few screws. A piece of 3/4” plywood was used for the top surface of the workbench and it overhang the base by about 1/2” on the front. 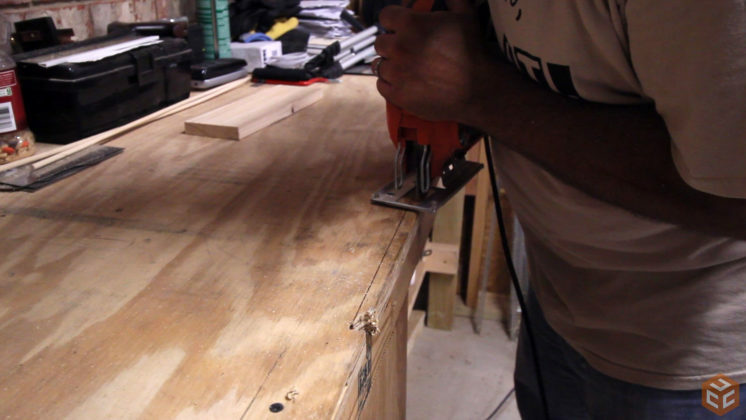 The front and back jaws of the vise need to meet flush which means the plywood top is in the way. 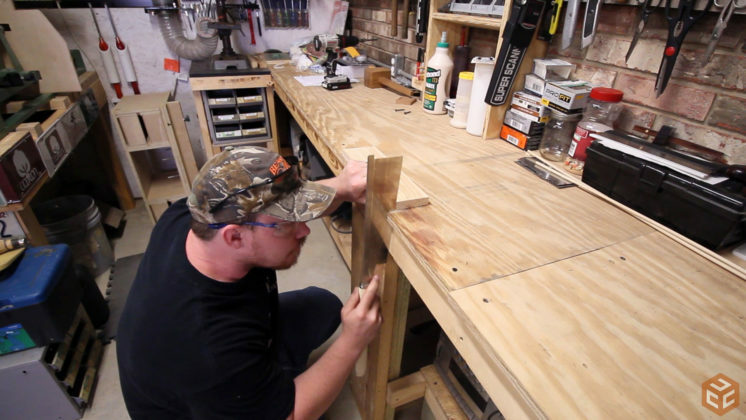 We could either pad out the frame below the plywood top to be flush with it or we could cut away a section of the plywood and add a solid piece for the fixed jaw of the vise. We went with the second option. I first established the ends of the cut with a hand saw. 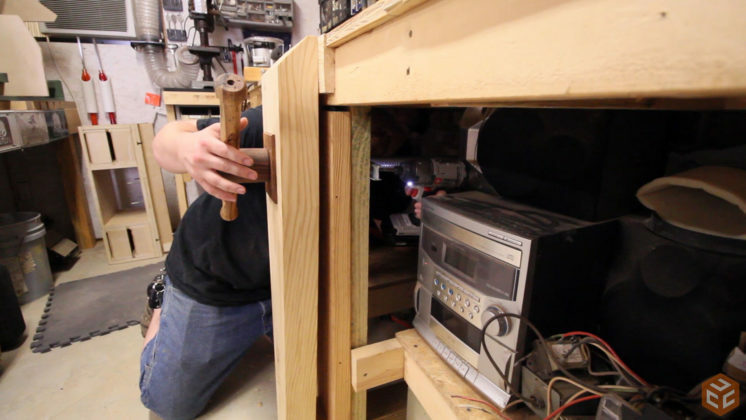 Then Shawn removed the rest of the material in between with a jigsaw and a router. The rear jaw is just a piece of 1×4 pine. It’s small enough that when secured with these six screws it twisted slightly to conform to the workbench frame behind it. That’s exactly what I wanted to happen as it means there is a solid connection and there shouldn’t be any problems out of the rear jaw. That also meant that the outside face of the rear jaw needed to be planed flat. After making sure the screws were far enough below the surface I planed the jaw flat. 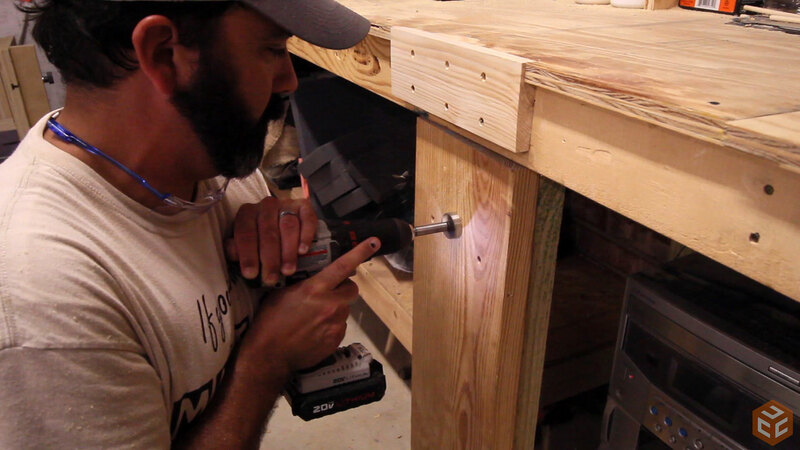 After some very careful measuring and marking Shawn drilled the hole for the leg vise screw. We made sure to position this so that when the vise is in it’s closed position the top of the vise will have room to trim flush with a hand plane. Then the vise screw can be inserted and the nut secured from the back side with a couple wood screws. 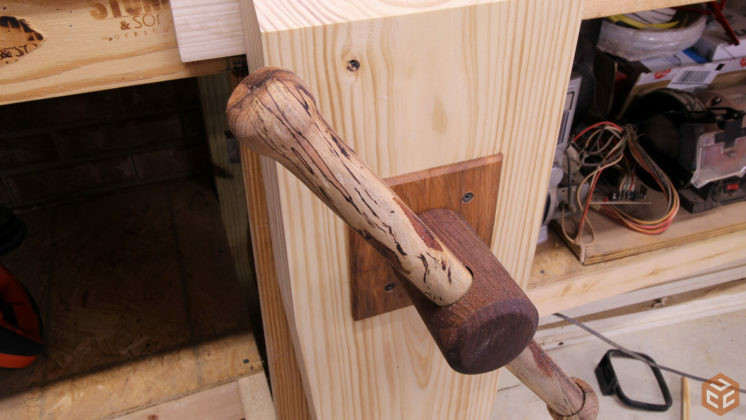 This particular leg vise is modeled after mine. I don’t have a parallel guide at the bottom so I kick a wedge left or right on the floor to prevent racking with different thickness materials. Shawn decided that it wouldn’t be an inconvenience to just use scrap wood as needed. A typical parallel guide also prevents the front jaw from rotating as the screw is advanced. To combat this I used a scrap piece of wood secured to the side of my leg vise that references off the side of the workbench leg. 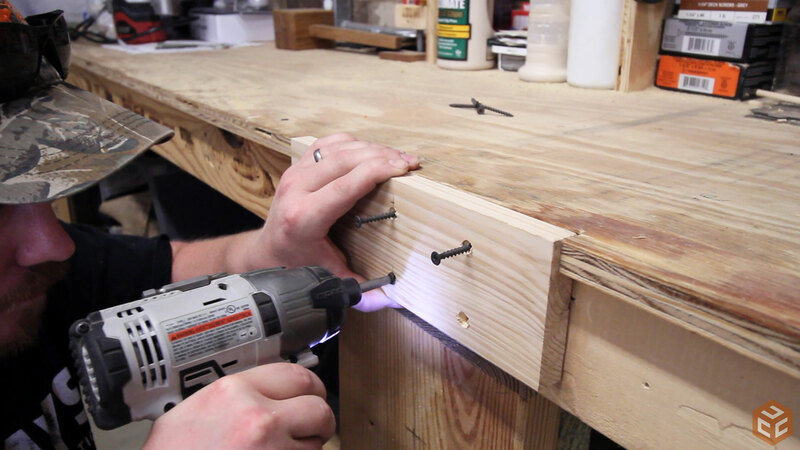 We chose to do the same with this vise so a notch needed to be cut out of the existing leg of the workbench. 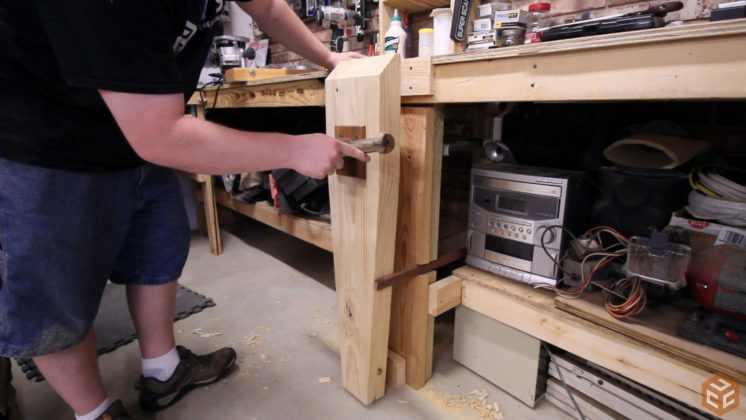 A scrap piece of wood can then be secured to the side of the leg vise. At this point the vise is complete. The vise should open and close easily with just one finger. 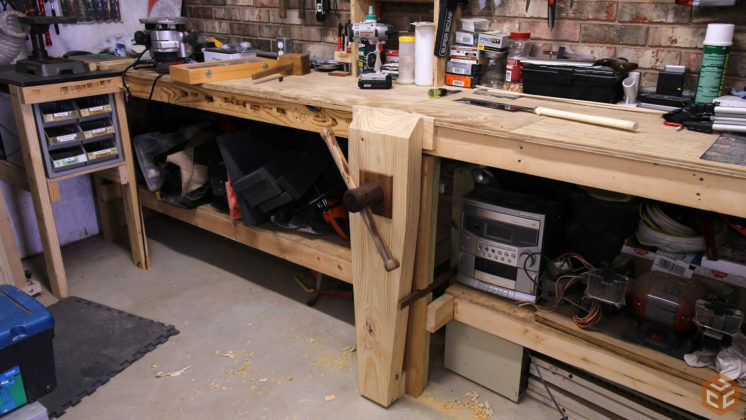 The added horizontal scrap piece on the right tracks with the side of the workbench leg and prevents the vise from rotating clockwise as the vise is closed. 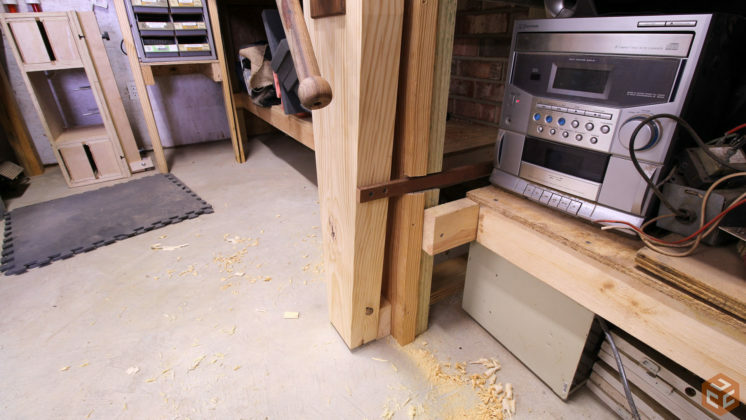 And spacer blocks can be added or removed as necessary on the ground to prevent the vise from racking. The vast majority of what is clamped in a vise like this will be close to the same thickness so adjusting the bottom won’t be often. Finally the top can be flushed up with a hand plane. 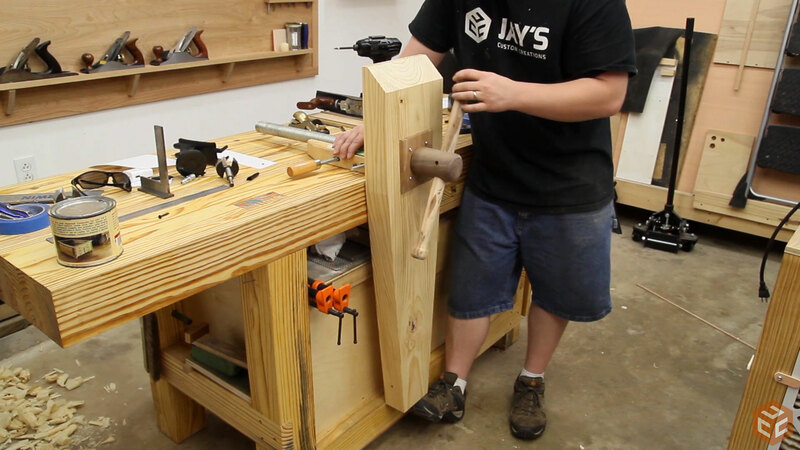 The end result is a fully functional, easy to operate, really strong leg vise in a solid, immobile 2×4 workbench. 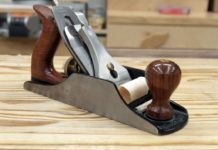 Even greater holding capability can be achieved by adding a thin piece of leather to the vise jaws. While it might be a little more work to make a leg vise I still prefer it over my cast iron quick release vise. 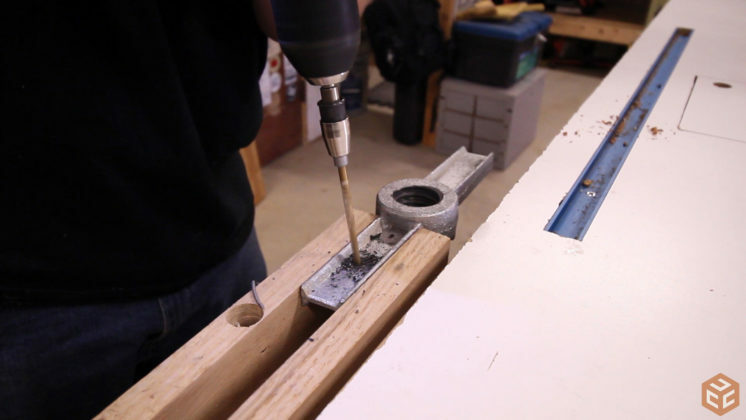 The leg vise has more vertical capacity from the screw up to the top of the bench, it’s just as quick and easy to operate, and more clamping power can be achieved with less effort. Although, these are just my opinions that I’ve acquired through interacting with the vises I’ve used. And if you’re not already subscribed to Shawn Stone’s YouTube channel be sure to stop by and subscribe if you like the videos and projects that he makes. I now crown you the King of Vises……. 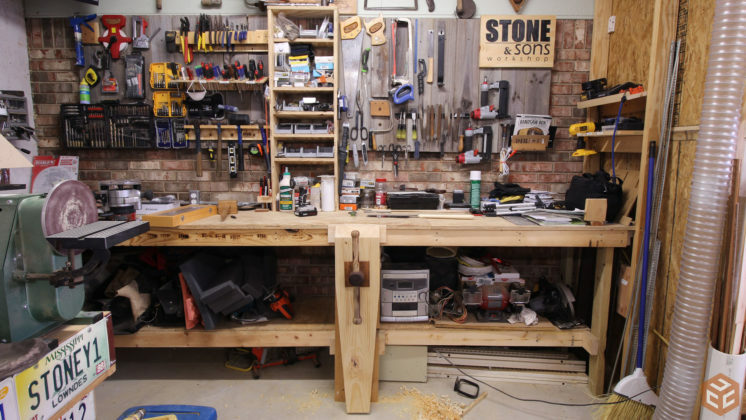 I think I will make one for my Harbor Freight workbench. I HAVE A FACTORY MADE WORK BENCH FROM HARBOR FREIGHT THAT I AM AFRAID WOULD NEED TO BE FASTENED TO THE WALL BEFORE I COULD USE A LEG VISE LIKE THAT ! YOU DID A NICE JOB ON THAT ONE THOUGH ! KEEP THE ARTICLES COMING , I AM 80 BUT STILL LEARNING , I THINK YOU KEEP LEARNING ‘TIL THE DAY YOU DIE ! 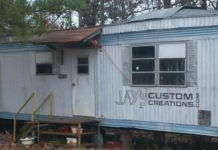 Jay I was thinking about your upcoming project to use the back side of your roll up garage door as storage space foa better flow pattern in your shop. What about designing 2 rustic looking SWING open garage doors heavy duty maybe with a caster closer to where the doors meet at closing. Then you could build shelving,or what space saving compartment you need to the back side of these doors. In the future if you and the misses decide to move the doors remain as very well build outswing doors. Maybe build them out of reclaimed Teak ? Just a thought. But what if it rains,either the stuff stored gets wet or Jay gets it, is Teak not a little too expensive over there?